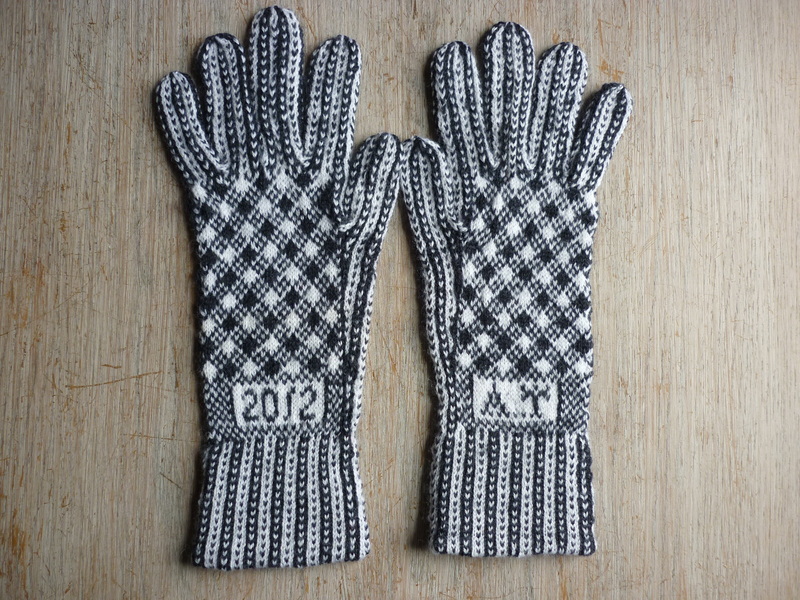 At last, and nearly a month later than I had planned, the Shepherd’s Plaid gloves are complete. They are a good fit on my hands. I’m not sure I like the yarn too much and don’t think I’ll knit another pair with these yarns, the Forsells 3 ply and the P and B Dreamtime baby yarn. As far as needle size goes, I think the 2.25 mm or 13 UK is good with this yarn, better than the 2mm or 14s. 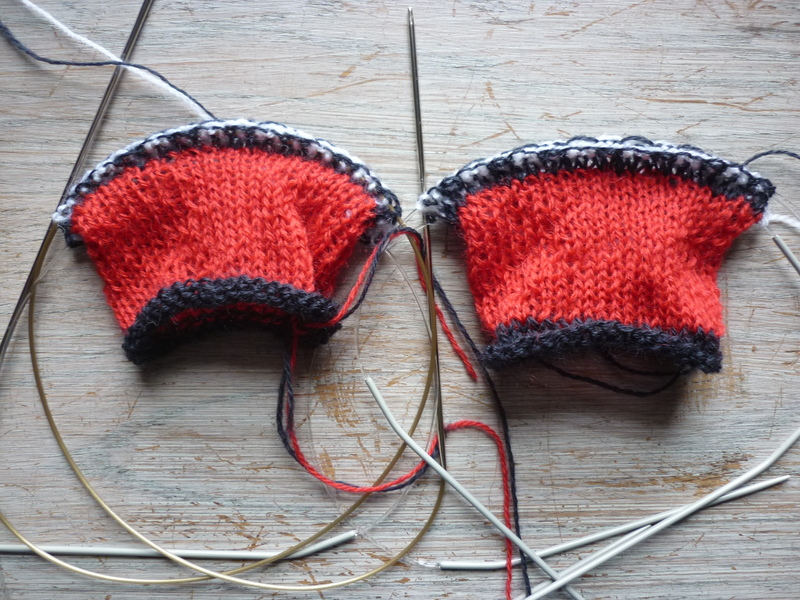 Using circulars for the hand and dpns for the fingers seems to work well. What do I like about them? 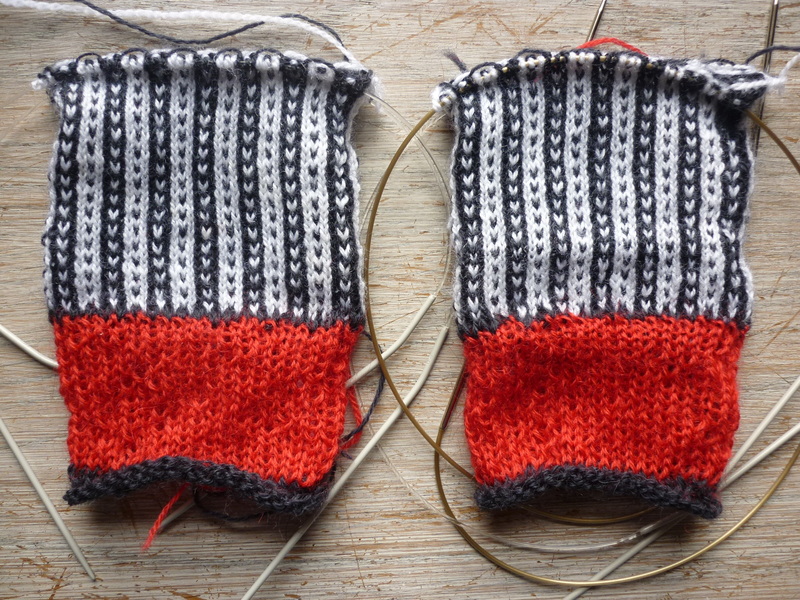 I like the red lining to the cuff, I like the two patterns, as they are both easy to knit without a chart, and I like the way I made the thumb pattern continue from the rib up into the thumb. Here they are, front and back views, having been steam pressed. I wonder if I should try to make a pair of ‘hands’ to put gloves on to dry rather than pressing? A blog from my phone! 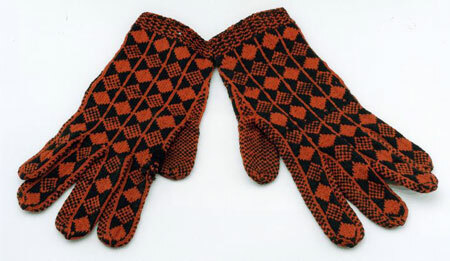 One Shepherd’s Plaid glove. From my phone. This is an experiment just to test out posting to the blog using my phone. It is possible but clunky to input text, so this is being added to from my laptop. Bit it’s good to know that I can post from my mobile if I’m away from my laptop – which I am sometimes! The fingers are coming on as I had a train journey yesterday and that is ideal time for this sort of small knitting. I’ve been trying out different ways of finishing the ends of the fingers, first with a s1, k2tog, psso, and then with k3 tog round the top, both in line with the three stitches vertical stripe. I think the k3 tog is slightly better but having spent half an hour earlier today unpicking the top of a previously completed finger I have to say the difference is not really visible. I’m starting plan the next pair and think I really cannot bear to knit from anymore of the documented patterns. Having got a feel for the numbers of stitches and how the patterning works I think I’m branching out. 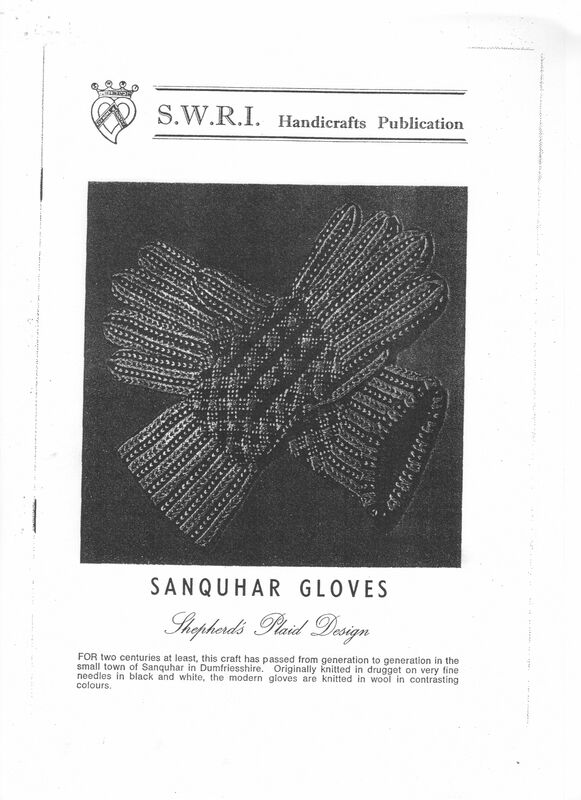 I may adapt from pictures of existing gloves. These I think from the Scottish National Museum are especially striking. I’m really enjoying knitting this pattern. It’s easier to see where you are with it and I’ve also adapted it so that I know exactly what’s going on. 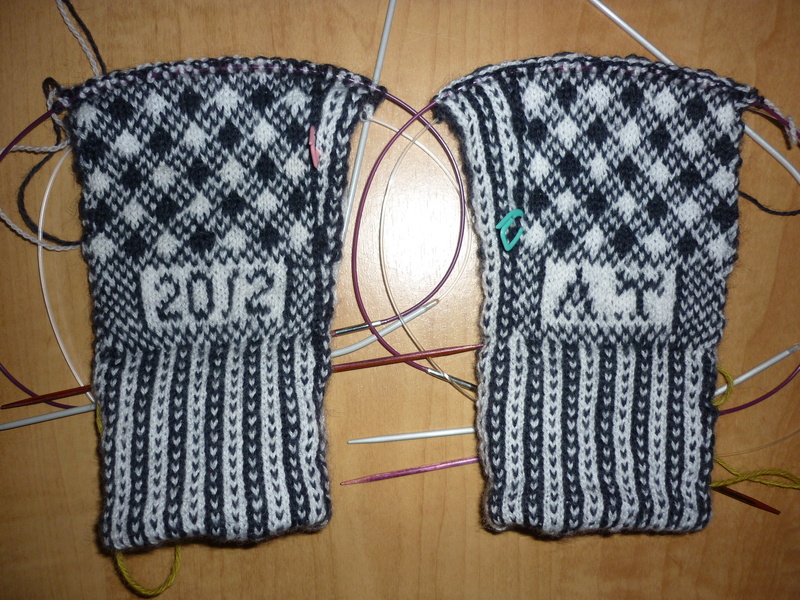 I decided to continue the rib pattern up the thumb gusset and then up the side of the hand. There were not enough stitches to get in two repeats of the Shepherd’s Plaid diamonds so putting in the vertical bars seemed like a good solution. They can be seen on the right glove above the thumb. Here’s the Shepherd’s Plaid ready to do the thumbs. The pattern is easy to follow as both the shepherd’s plaid and the thumb pattern can be worked out from the previous row. The new needles are working well but could do with being even shorter. 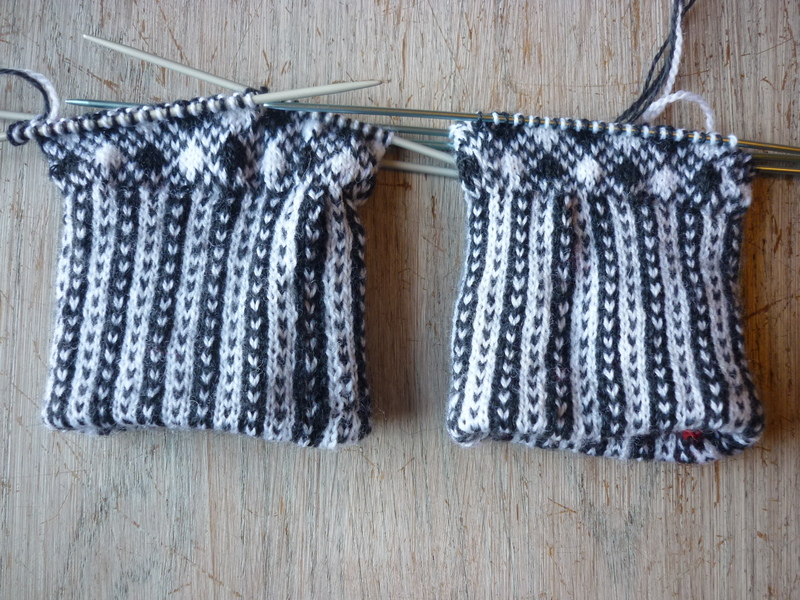 Well I should not have said anything about knitting these gloves being easy or easier… I fell and squashed my hand out walking in the Lakes last weekend so that slowed things down and now I have found that I have forgotten to start the stripes up the back of the gloves. The ones that the patterns says ‘should be understood’. I am going to unpick, or as the Americans say, frog (why?). The joins at the ends of the dpns are a mess, see below although it doesn’t look so bad in a photo. This is to do with my attempt to keep the knitting open after the Midge and Flea got so tight. So I’m going to take the one back to the start of the thumb and put it onto a circular needle, I’m just not sure what size. A 2mm and try to stay loose or a 2.75 or 3mm and try to stay tight? Also, I need to chart the whole hand. Up to press I have only charted the thumb, see pic, but I have bought the Intwined Studio knitting charting software and can’t use it as the serial number doesn’t work. The help line in Chicago is not being fast answering my query. Progressing nicely, if slowly on these. Have put them on UK size 13 needles to open them up a bit. The Midge and Flea got very tight and are quite small on my hands and I want these to be that bit bigger. I had to search for size 13 dpns, 2.25mm, although I have boxes of them they were muddled and had to be sorted out. So i did that and found 2 pairs. I am wondering whether to invest in Additurbos in all these smaller sizes but that’s another post. I had been struggling to find an online or ‘real’ source for these but found Pavi yarns yesterday who look to have a good selection. I bought one 2mm one a week of so ago in Purl City, Manchester, but it’s really long, 80cm I think and although it’s nice to use it’s also a bit in the way. Here’s the SP up to the start of the thumb. 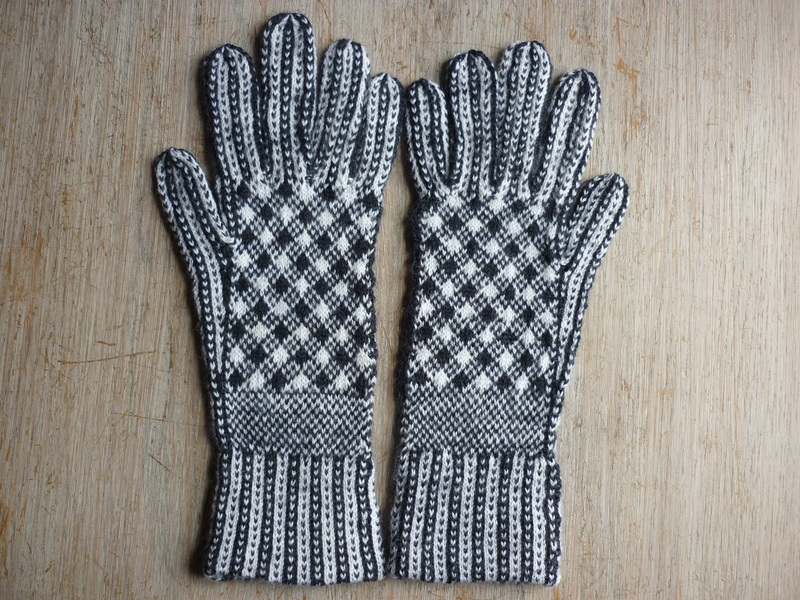 This glove has two pattern elements, both easy to follow and rather elegant. 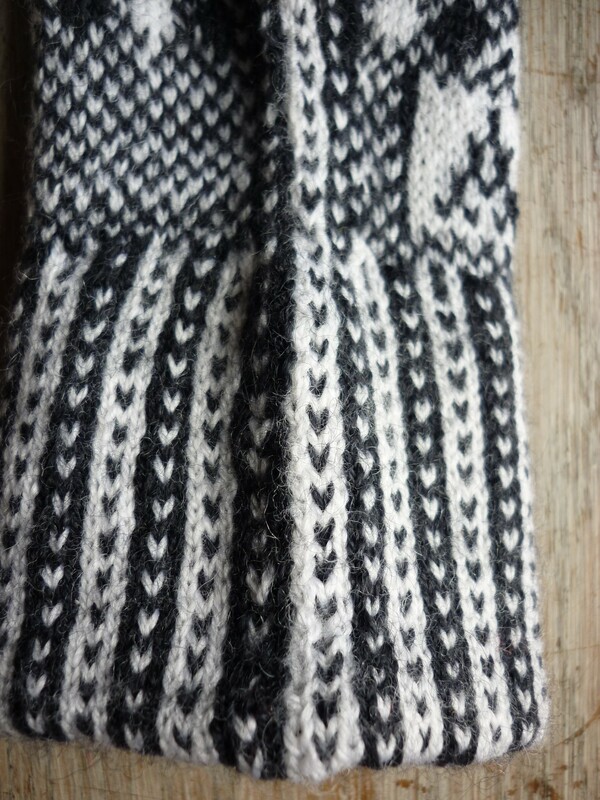 The cuff is just two rows or rounds, one alternate black (B) and white and the other 3B, 3W which knits up into the rather striking spotted rib effect. The SP itself is also easy to follow as the pattern sort of tells you where you are with it. alternate rows of B and W, then little groups of 3s, then one row 5B and 5W, then back again. For some reason I find it much easier than the Midge and Flea which I had to follow row by row on a chart. That’s all for now, folks, more on knitting software, needles and knitting thumbs, not to mention altering the pattern, later. Turning up the cuffs – looks good! 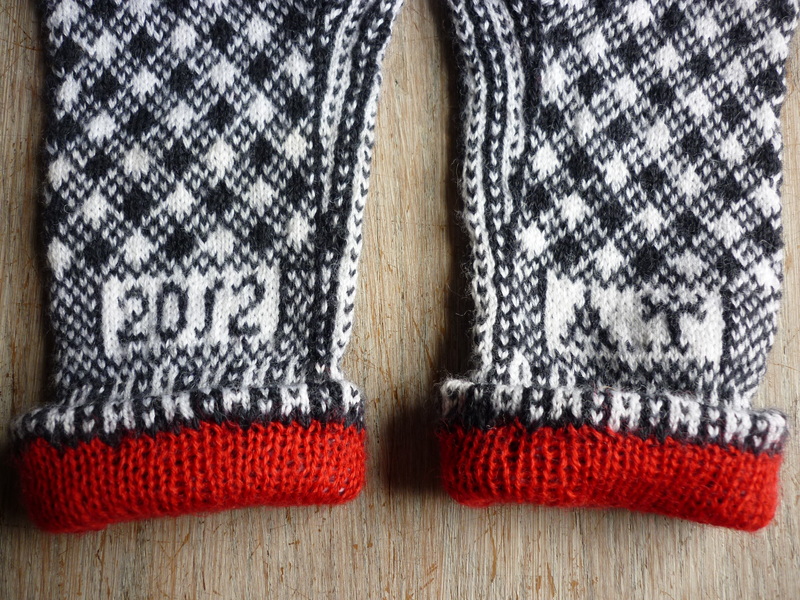 Top one shows outside while bottom one shows red lining knitted very loose as per the pattern. They are both on dpns as I wanted to go up a needle size and don’t have circulars in a UK 13 (2.25mm). 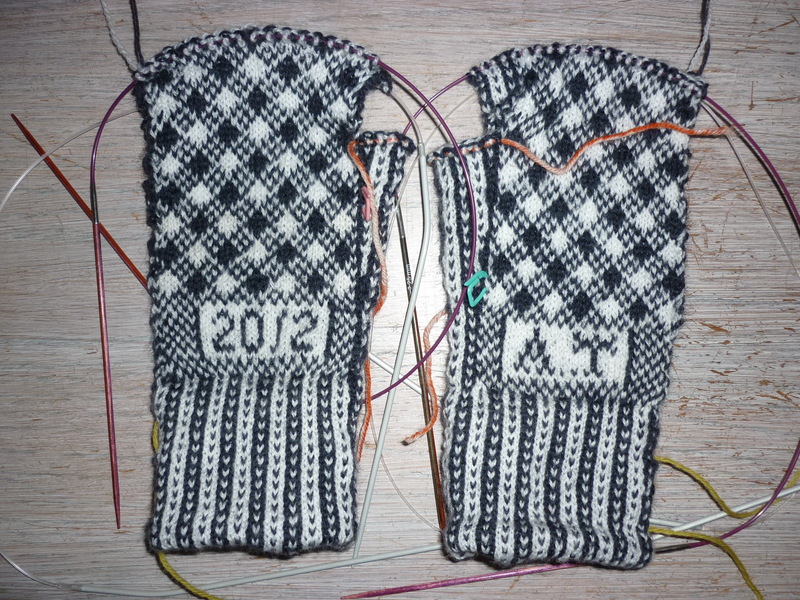 I’ve completed the cuffs and cuff lining on the Shepherd’s Plaid gloves, see below. Now I’ve go to decide whether to knit up the cuff lining in place, as the pattern says, or whether to stitch it up when the gloves are complete. The instructions for knitting the hem up are extremely convoluted, even by the standard of these SWRI patterns, suggesting different size needles and two stitches for one etc. What I must do is to darn in all the ends before turning up the hem as the cuff lining is so loose that they will work through again if not darned in. The written out instructions are incomprehensible so I’ve done a chart. I’ll need it more for the placing of the thumb gusset. There are also stripes up the back of the hand which the pattern says ‘have to be understood’. These patterns might be adequate if these gloves were all you ever knitted which might have been the case if you were making them for income, but if they’re something you just do occasionally they don’t make much sense. 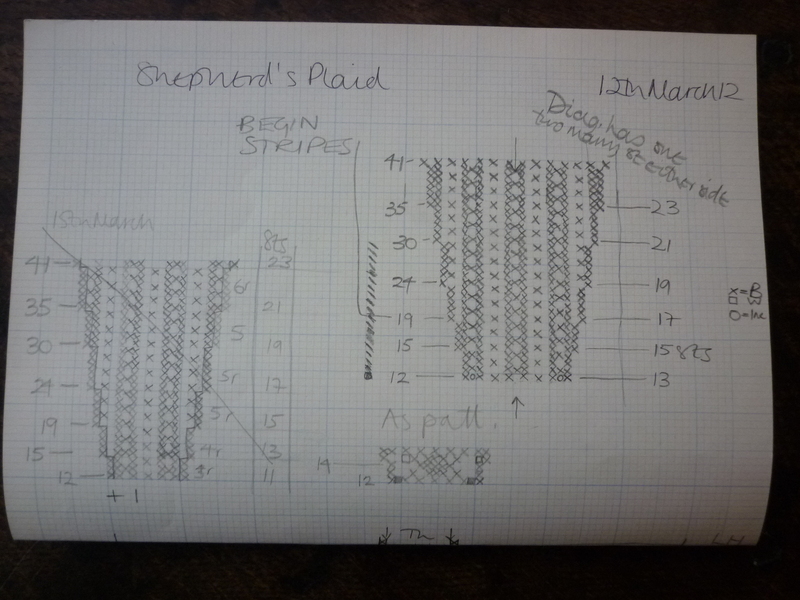 I’ve started the Shepherd’s Plaid Sanquhar pattern and very odd it is too. The cuff is not ribbed but stocking stitch. I’m doing knitting things I’ve never done before like casting on on needles 3 sizes bigger with half the stitches and then doubling the number and changing to smaller needles. 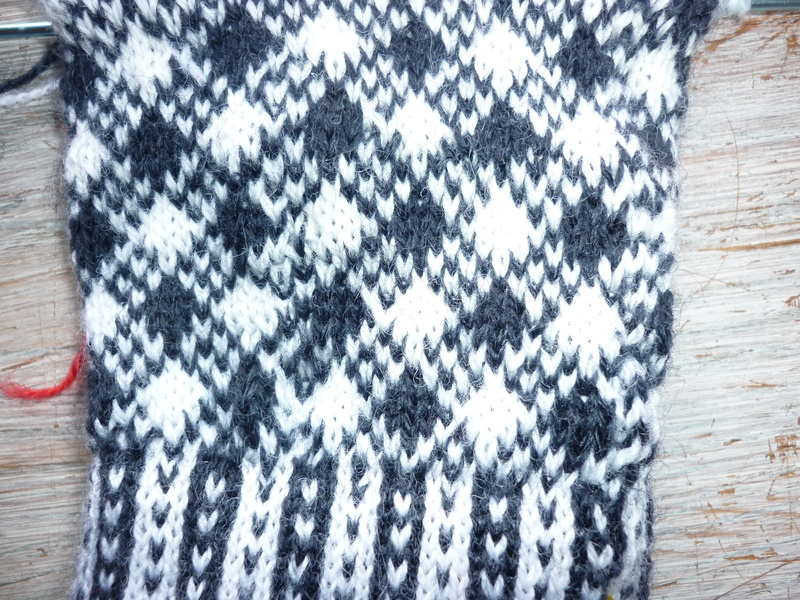 That’s for the cuff lining which is in red on the pattern with the main glove in black and white. I decided to go with these colours as it uses the white wool from the original pair in the Duke pattern so it will make a good match. Also the black, or charcoal as it is supposed to be, look good together and the red will also look good in the cuff lining. 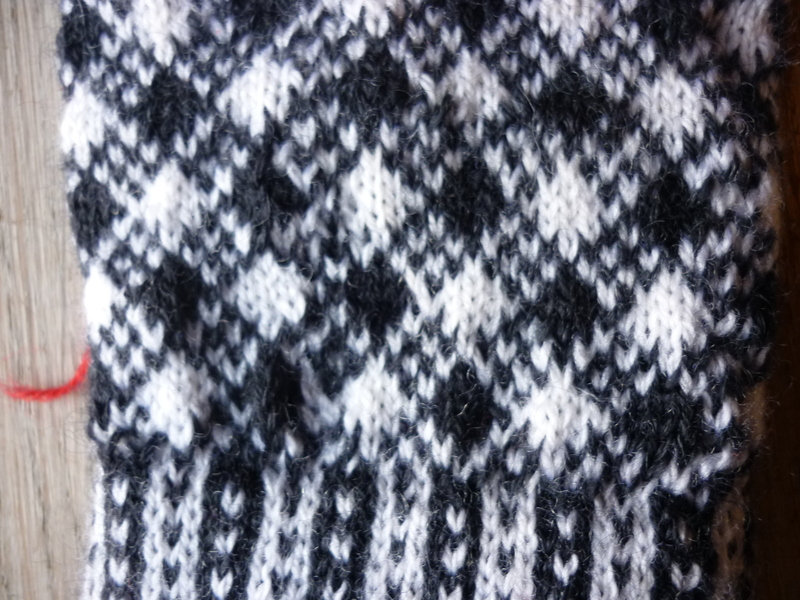 The pattern is eccentric – it is the only knitting pattern where it tells you that the pattern will not fit the number of stitches. I have no idea what that’s about and have altered accordingly. There’s blind following and blind following. The front page of the pattern from the Scottish Rural Women’s Institute. 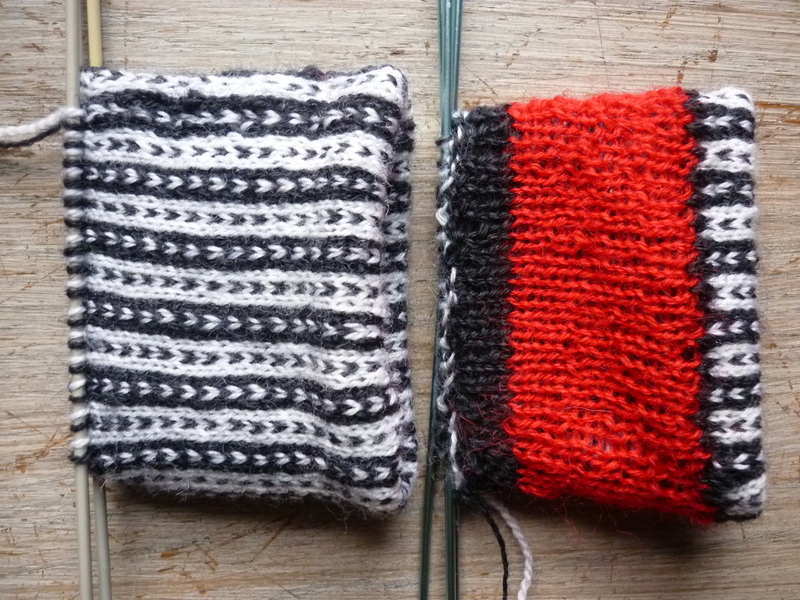 Here they are with the cuff lining knitted, very open and uneven in the red, and the start of the broken stripe for the outside cuff. You can see how open – the technical term is sleazy – the red knitting is – fine 3ply on UK 11 needles, hard to get it even on dpns but it should wash or steam out. I’m very pleased to have found your blog, as I’m really struggling with this pattern, of which I have an original copy, bought when passing through Sanquhar in the 1980s! I knitted the ‘right hand glove’ over a year ago, and when it was finished, it was a left-hand shape, with stripes down the palm instead of the back! I gave up in disgust and only went back to it a few weeks ago when I picked a newsletter from A’ the Airts and found the link to the SWRI site. I’ve redone the right hand from below the thumb, placing the pinky where I thought it should start instead of where the pattern said, and it now fits the right hand, but the stripes are not quite in the right place, so I’m wondering how on earth I’m going to manage the left hand one! have you re-written the pattern since completing them? If so, I hope you’re going to re-publish it, because I hate to be defeated by a pattern but don’t know if I can waste any more of my life in trying to make it work! I ended up charting the pattern as I found the written out SWRI pattern almost impossible to follow. I also made some alterations to how the wrist pattern goes into the hand. If you’ve done one I suggest you work it out from your first one how the second one goes!